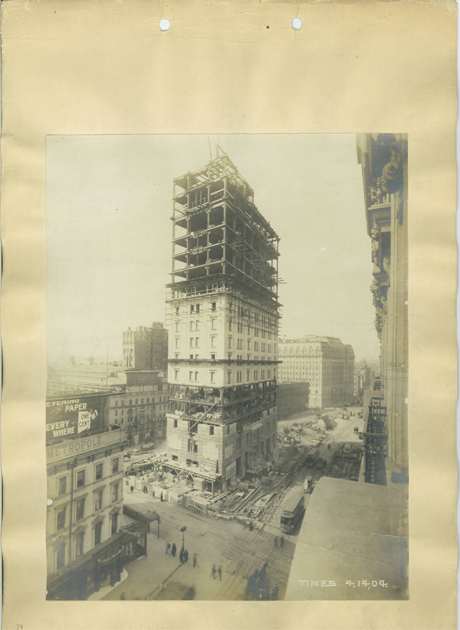 In August 1896, the publisher Adolf S. Ochs purchased the New York Times, a respected daily whose circulation had dropped to just more than 9,000 copies. 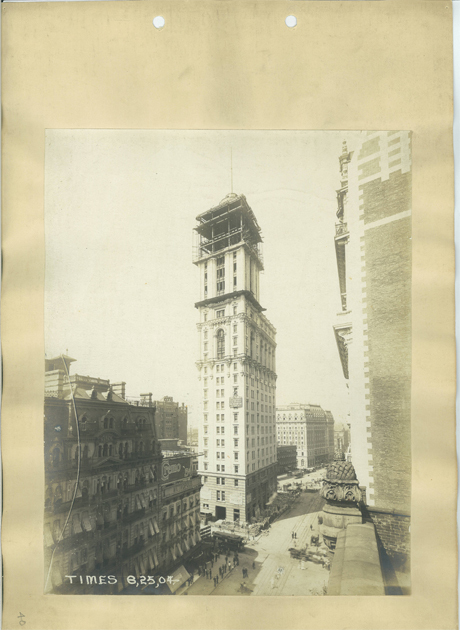 He began a successful campaign to reinvent the paper and increase its circulation, and by 1903 when construction started on the Times Tower, sales had grown to more than 106,000 copies. 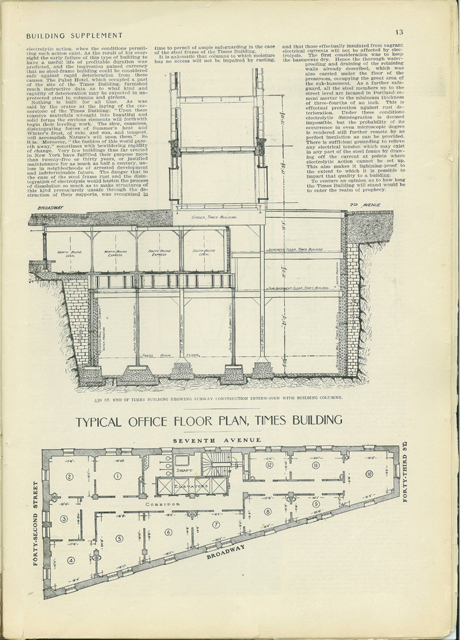 Needing more space to grow his business, modernize his printing operations, and make clear the ascent of the paper under his leadership, Ochs planned a new headquarters building. After failing to secure a suitable site downtown near Newspaper Row, he chose a tiny, but very conspicuous lot between E. 42nd and 43rd streets where Broadway slices across Seventh Avenue. The New York Times January 1, 1905 Supplement, cover. On loan from the collection Mark Tomasko. A major attraction of the site was its location contiguous with the new IRT subway tracks and station then under construction. The subway stop was named Times Square even before the tower was finished. The connection to the subway gave the Times considerable advantage to use the trains for the rapid distribution of papers which could be transferred directly to the subway platforms from the basement press room. But the tiny size of the building's lot at ground level, constrained by the major streets, made it an illogical choice for either a functioning factory or a profitable office building. 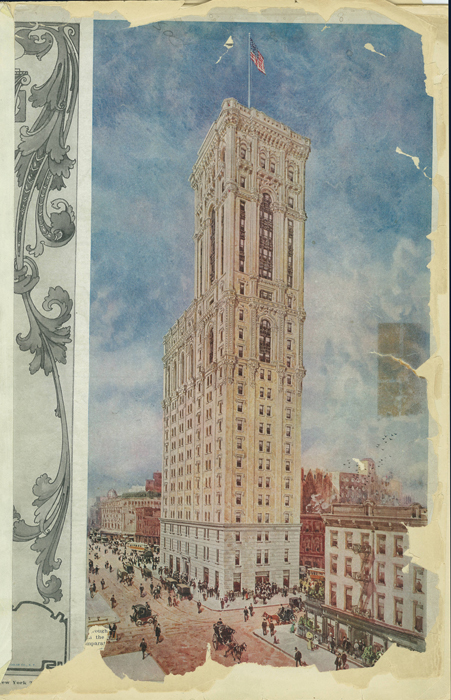 The area of the large office floors was only about 4,100 square feet, and in the tower section a mere 2,140 square feet. The various departments of the paper occupied floors 12 to 22. 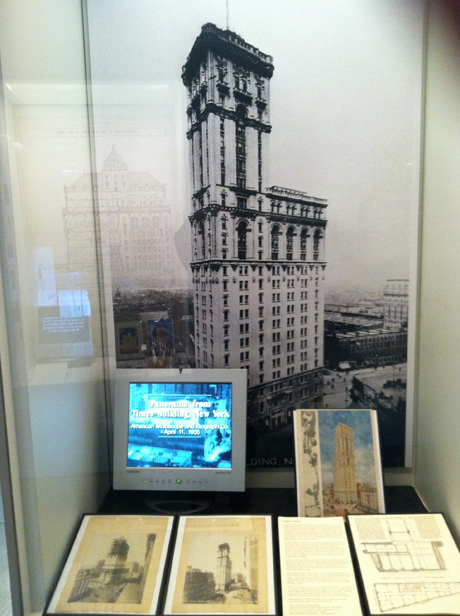 Ochs's office was on the 20th floor, and he kept a private room in the observatory on the 24th floor. The sidewalk-level public arcade and publication office and the lower eleven floors were leased to tenants. Page from Times January 1, 1905 Supplement. Construction progress photos lent by The Collection of the Partners of HLW International.